Case Study: Mr. Shitiz Singh, Account manager in IDEACTS. 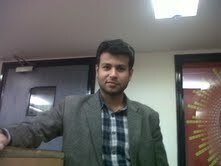 Home > Blog > Blog > Case Study: Mr. Shitiz Singh, Account manager in IDEACTS. Shitiz Singh is a young and talented digital marketing professional currently working in IDEACTS as an account manager. He has done PGDBM in marketing & finance from Appejay School of management in Delhi. He has also completed a certification in digital marketing from DSIM. It was almost 4 ½ yrs of his career and Shitiz was still facing challenges in his career growth as it seemed stagnant. He realized that simple MBA is not going to guarantee him a career & felt the need to enhance and upgrade his knowledge and skills. After doing a lot of research he found that when all other industries are struggling to have a growth rate of even 5 to 10% digital marketing industry is growing high at a rate of 30% which is actually a good number. Thus, it became easier for him to decide whether he needs to learn digital marketing or not. Besides, he found that demand for young and talented digital marketing professionals is increasing day by day but the supply is too low as very few people have the core knowledge of digital marketing. So, he finally decided to get trained in digital marketing. However, now he had a new concern as to which institute to join to get the training. He again did a lot of research and even went to different institutes. He attended the demo session at DSIM and found the institute to be well-resourced in terms of infrastructure and faculty. In his words, the way training was delivered it hardly took him an hour to settle on pursuing digital marketing training through DSIM. “The first thing that I learnt at DSIM was to create my own website. Later on the trainer went ahead and trained us on how to market the website effectively. They actually made us practice all the tactics which helped me get my concept on digital marketing clearer. We covered every part of digital marketing that included everything starting from digital marketing overview to website planning and development, search engine optimization, search engine advertising, social media marketing, lead generation for business, online advertising, email marketing, creating internet marketing strategy, Google analytics, ecommerce marketing, making money via adsense & blogging, affiliate marketing and making money as freelancer. I mean every component of digital marketing was covered during the training and that too with hands on practice. It seemed as if I was doing some kind of on job training. Digital marketing training showed its results in matter of days and not even months. He appeared for the interview in IDEACTS for the post of the account manager. He not only got through the interview but also got a hike of 4 lacs on his salary. Earlier, at his previous job he was earning 4 lacs as his annual CTC but his new CTC in the new company went higher and he is getting 8 lacs as his annual remuneration.